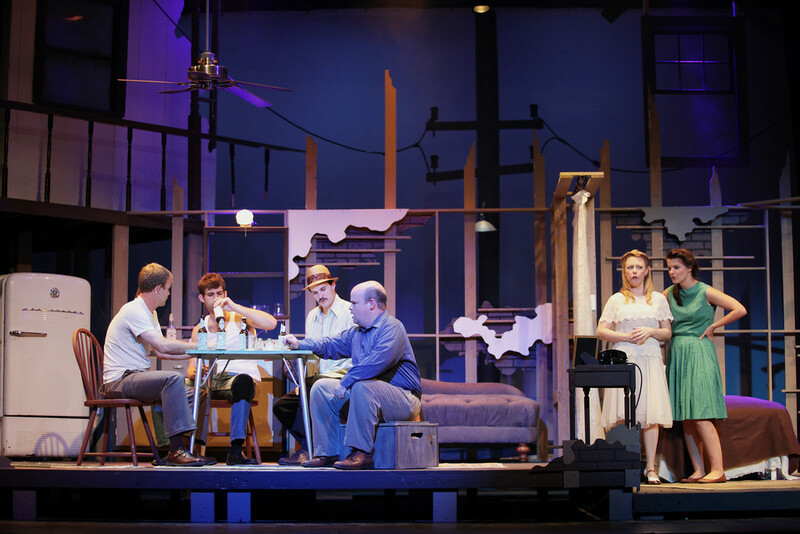 A STREETCAR NAMED DESIRE was first produced in 1947; you would naturally think a show over 50 years old might feel antiquated and outdated. Put it in the notoriously nostalgic Covedale Theatre and you might wonder if the show could overcome its natural obstacles. Could “Streetcar” possibly work on the west side of Cincinnati in 2014? In the capable of hands of director Greg Procaccino, it does. Wow, does it ever work! This show is my must-see pick of the week. Instantly, the energy is palpable. As the actors move about the stage, preparing for their evening, there is a sense that something is happening in this quaint corner of the French Quarter. And then enters Blanche DuBois (Kim Long); things are about to get very interesting. Blanche is looking for her sister Stella (Maggie Lou Rader) and she is shocked to find her living in such humble conditions. But Stella is quite happy, married to the polish stud, Stanley Kowalski (Cliff Nunley), and is secretly expecting his baby. He’s “common,” angry, and very dangerous. But Stella loves him; she isn’t afraid of him, and he’s not as dumb as Blanche thinks he is. In fact, he’s on to her and has spoken to some acquaintances of his about Blanche and her recent past. Things just don’t add up. And do they ever unravel. How good is the cast? Anytime Burgess Byrd and Bob Allen are in the ensemble (with only a handful of lines between them) and you don’t walk away thinking “they should have done more” you know the cast is stacked. I can’t imagine better casting; Rader is a breath of fresh air in this dark, hazy place. She is full of love and sees Stanley for all his good points, so much that she overlooks his very, very bad ones. Nunley towers over his co-stars; rarely do we see a true leading man so full of charm, grace, and sophisticated dark energy on the stage locally and the Covedale is fortunate to have had him in two Tennessee Williams plays now (“Cat on a Hot Tin Roof” was his most recent production here). Mike Hall plays “Mitch,” a nice guy who lives with his mother. She’s sick and he’s hoping to find a wife so that he won’t have to be alone forever. Blanche seems like a good candidate . . . until you get to know her and her past. Hall is low-key, subtle, and grounded in his performance. His scenes opposite the histrionic Blanche are some of the best in the play. Long, with a high-society Southern accent and old-fashioned allure, would steal the show if it weren’t for the talent of her cast (and likely the restraint of her director). She’s had three terrific performances since getting to town, starring in PETER PAN at CMT last year, keeping up with the best of the best at CSC in PRIVATE LIVES, and now commanding the stage at the Covedale. The rest of the ensemble is superb, too, especially Katey Blood as “Eunice,” the upstairs neighbor and Daniel Lees as the young collector who first give us a glimpse into Blanche’s secret taboo-filled history. The set by Brett Bowling fills the stage with New Orleans-style intrigue; it looked hot and sweltering, with a wood, exposed brick, and a working ceiling fan. Denny Reed’s lighting and sound design were impeccable; the choice of music between scenes kept us in the moment and the use of lighting effects was both effective and beautiful. I really can’t say enough nice things about this production. This show is a knock out, first-rate hit. I hope it sells out. 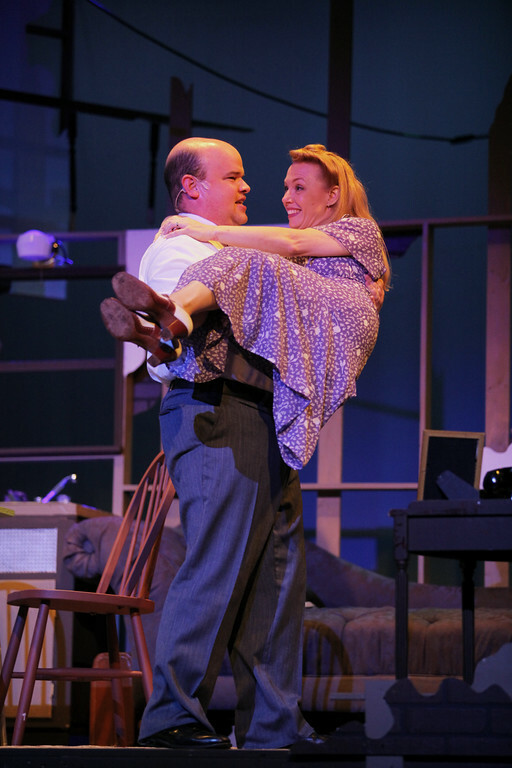 Run – don’t walk – to the Covedale Center for the Performing Arts’s production of A STREETCAR NAMED DESIRE. Tickets are available here. It runs through October 5th. You are so correct about Street Car Named Desire – run don’t walk to see it! !